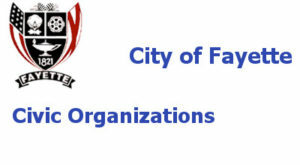 The citizens of Fayette express their civic mindedness by participating in a variety of organizations that benefit their fellow man locally, nationally and internationally. This interest in the well-being and advancement of others helps Fayette maintain a positive outlook and expectation for the future. Fayette’s citizens don’t just participate in societies of a national scope, but also initiate their own when local needs are felt. This provides an opportunity for all to show their heartfelt interest in their nearby neighbors. Your support or participation in any of these would be welcomed. If you have a suggestion for a need not presently met, please click here to submit your idea. Celebrate Recovery is for people who struggle with all kinds of hurts, habits, or hang-ups. Often times it’s the deep hurt and pain in one’s life that contributes to hang-ups and destructive habits. We seek to help heal from the pain and hurt and not just the symptoms. This is a community ministry of the Fayette First United Methodist Church. We do not try to pull people away from their own place of worship but encourage their involvement in their own churches if they have one. We have people from all across the community that help support the ministry as well as from within our church. We would love for you to help promote this ministry. 6:30 p.m. Eat – A free meal is provided by various community members and our church. 7:00 p.m. Large Group Meeting – We open with worship songs then review the recovery principles and steps. We alternate between a lesson on one of the principles or a testimony from someone who has been through recovery. 8:00 p.m. Gender-specific small group discussions – This gives participants the opportunity to discuss the lesson or testimony and share a bit about what’s going on in their life. This also helps make connections and find support and accountability partners to help. 8:30 p.m. Wrap up, coffee and fellowship. Those interested in helping with this ministry are welcome to sponsor meals and events. Christian Center of Concern – is located next to West Alabama Bank on Hwy 171/43 in Fayette. They are open on the first 3 Wednesdays of every month from 8:00-10:30 AM to provide food to people in need. As a non-profit organization (501) c(3), it operates entirely with volunteers and donations and is supported by the entire community. Donations from local churches, individuals, businesses, food drives from schools, civic groups, and the USPS. Any who could use their services are encouraged to contact them. They will need proof of income and residence (power bill), to meet certain qualifications. This organization desires to show the love of Christ by sharing the generosity of its supporters. DAR – Daughters of the American Revolution is an organization made up of ladies who have an ancestor who either fought in the war for Independence or served the American cause against England to provide independence. It was incorporated by an act of Congress approved in 1896. There are over 974,563 members. There is over 2,950 chapters in all 50 states and internationally. The local chapter for Fayette, Alabama is called the “Luxipallila” chapter. It was named after a river which runs through the county. The “Luxipallila” chapter was organized October 30, 1952 by Mrs. Alva McGriff, Grimsley. The “Luxipallila” is a member of the state organization, “Alabama Society – Daughters of the American Revolution (ASDAR)” and the national organization, “National Society – Daughters of the American Revolution (NSDAR)”. Their motto is: “God, Home and Country“. The local chapter “Luxipallila” meets on the 2nd Saturday morning of each month from September through May in a members home. The Daughters of the American Revolutions (NSDAR) national theme is: “Unity of Spirit – Unity of Purpose”. Delta Kappa Gamma is an international society for women educators. Exchange Club The Exchange Club is an all-volunteer, national service organization made up of men and women who want to serve their community. The Exchange Club is made up of nearly 1,000 clubs and 33,000 members throughout the United States and Puerto Rico. Exchange Clubs are known to millions as America’s #1 Service Club. From the organization’s earliest days, Exchange Clubs have been serving their communities and improving the quality of life. The large array of Exchange-sponsored programs and projects has made impact on America and therefore enhancing the lives of countless men, women and children throughout the nation. Meetings are held at noon on the 1st and 3rd Monday of each month at the Tom Bevill Building in the Guthrie Smith Hall at Bevill State Community College located at 2631 Temple Ave. North in Fayette, Alabama. Dues are $40.00 a quarter and this includes lunch. Fayette Amateur Radio Club The Fayette County Amateur Radio Club meets at 7:00pm on the First Tuesday of Every Month at the Fayette County Emergency Operations Center, 118 1st Ave NE in Fayette. This is the same building that houses the Fayette Police Department, Fayette Fire Department, Fayette County 911 and Fayette County Emergency Management. Please enter through the main door facing 1st Ave NE and tell the 911 Dispatcher you are there for the HAM Radio Meeting. Fayette County Amateur Radio Club is a group of diverse individuals dedicated to working with our served agencies to help provide Emergency Communications. Our mission is to assist our Served Agencies and to help provide Emergency Communications in times of need and to help to make our community a better place to live. Fayette County Amateur Radio Club is a Non-Profit Volunteer Group. We work with a diverse group of Served Agencies, Fayette County Emergency Management Agency, Alabama Emergency Management Agency, US National Weather Service, American Red Cross, Salvation Army Disaster Relief, Alabama Baptist Disaster Relief, Church of Latter Day Saints Disaster Relief and others. We are ready at a moments notice to respond to any Natural or Man-Made Disaster or any kind of Special Event such as Marathons, Bike Rides, Air Shows, Ect. All Amateur Radio Operators are encouraged to attend and anyone interested in Amateur (HAM) Radio, Emergency Communications or Disaster Preparedness is welcomed and encouraged to come out and join us at our meetings. Fayette Garden Club is a Federated Garden Club. It was established in 1952 and has 11 active members. The Garden Club is a member of the Garden Clubs of Alabama (GCA), National Council of State Garden Clubs, and the Deep South Region of National Council. The Garden Club meets the first Tuesday night of every month from September through May at 7:00 p.m. to 9:00 p.m. in the Recreation Room at Yester Oakes Apartments. Dues are $10.00 per year and are payable in the fall at the September meeting. The local Garden Club belongs to District IV of the Garden Clubs of Alabama (GCA). Members attend the bi-annual district meetings where reports from other Garden Clubs provide both ideas and incentive. Membership is open to all people with an interest in beautifying our world, and have a genuine interest in gardening. Gardening ability is NOT a necessity. The Motto for GCA is “IN A STATE WHERE GARDENS GROW – GOD WALKS“. The National Garden Clubs theme is “Celebrate Your Garden”. Fayette Historical Society, is headquartered in the Old Train Depot. It is open on Sundays from 2:00 p.m. until 5:00 p.m. but group tours may be requested for other times. For more information or to schedule a tour contact Eddie Campbell at (205) 270-0035, Glenda Robertson at the Civic Center (205) 932-8727 or City Hall at (205) 932-5367. Fayette Progress Club of Fayette, Alabama was organized in 1921; its first objective being to establish a public library for Fayette. The current facility was built in 1956, and is continually expanding, developing, and providing equipment, books, technology, audio, visual, as well as programs for children, schools, all peoples of our community. The Club meets the 2nd Thursday, 2:00 p.m. at the Library. Interesting and enjoyable programs are presented each month that are both educational and promotes civic betterment. To consider becoming a member please contact—Ms. Susan Dodson (205) 270-3200 or Ms. Toni Robertson (205) 932 5307. Fayette Progress Club 2 is a group of ladies that have an interest in the educational and artistic subjects combined with civic development. We meet every 3rd Tuesday of each month except May, June, and July at the Fayette Memorial Library. Being a part of this civic group has many responsibilities as well. We support many projects throughout the year including the Fayette County Memorial Library, Fayette Park and Rec, Girl Scouts, mental health gifts, and blind maid goods just to name a few. These contributions require us to do fundraisers to generate funds to dispense. Our long standing fundraiser is our community birthday calendars. We also do two other fundraisers, one in the spring one in the fall, which allows us to get out in our community and make our club known. We are totally non profit and all of our profits are donated each year. We also give a Women of the Year award each year to a deserving woman in our community which is voted on by our club; she is honered at our annual Thanksgiving meeting in November at the Civic Center. We will be having our fall fundraiser on Tuesday, October 8 from 4-6 in Charles’ parking lot where we will be selling hamburgers with chips, drink and dessert for $6.00. Our current president is Tori Scott she can be reached at (205)712-2480. If you have any question about our club, or interest in joining our club, we vote yearly on new members as spots come available. You may also call her if you would like to purchase a hamburger fundraiser ticket and or a birthday calendar or add your loved ones birthday to our calendar. Gideons International meet at Charles’ Cafeteria on Saturday mornings at 7:00 a.m.
Healing Hearts Grief Support exists to help individuals understand the process of grief and mourning, normalize feelings and facilitate the healing process. Many of our members have experienced the feelings associated with loss and the difficulties of dealing with those emotions. The group provides a safe place to express feelings and thoughts without fear because we understand through our own similar experiences. We have been where you are; let us walk with you down the path. Healing Hearts Grief Support is a mutual help support group. This group helps navigate the difficulties of a loss. No one has to talk but everyone is encouraged to. Each month, we will discuss the issues and concerns common to bereaved people including . . . Contact Dana Beavers at 205-361-0088 for more information. Hope’s Choice of Alabama is a pregnancy resource center providing abstinence, pregnancy, maternity and parenting resources in Northwest Alabama. Hope’s Choice provides compassionate, life-affirming services, and support to women and men facing unplanned pregnancies in Fayette, Lamar, Marion and Pickens counties. When pregnancy is experienced as a crisis, we believe the solution is to eliminate the crisis, not the baby. Hope’s Choice offers practical, compassionate support, removing the barriers that cause people to choose abortion and empowering them to make positive choices for themselves and their families. Hope’s Choice is a 501(c)3 non-profit organization. Joey Day – Created by the Fayette Jaycees many years ago, but now sustained by Chuck Langley, this local organization provides clothes and toys for needy children at Christmas. Volunteers are welcomed and contributions may be sent to Joey Day Project at P. O. Box 309, Fayette, AL 35555. You may contact Chuck Langley at (205) 932-3255 for more information. The Fayette Kiwanis Club works to improve the quality of life for children and families of Fayette, Alabama Kiwanians participate in projects and fund raisers that provide assistance to local charities, hospitals, schools, shelters, other community organizations, and individuals. Fees are $20.00 per month, and includes breakfast each Thursday morning. Meetings are held each Thursday at 6:30 a.m. in the Kiwanis building, located on the corner behind the new post office in Fayette, Alabama. United Daughters of the Confederacy (UDC), is an organization made up of ladies who have an ancestor whoe either fought in the War Between the States or served in the Confederacy in some capacity during the war. Education is and has always been a priority with the United Daughters of the Confederacy (UDC). The Annabella Drummond McMath Scholarship was established to provide women over the age of thirty with the opportunity to continue their education. There is at this time, only one chapter in Fayette. Until a few years ago, there were two chapters. However, many of the members are deceased and due to the fast paced lifestyle of today, many of our young women do not have the time to be active in the organization. The remaining chapter of the United Daughters of the Confederacy (UDC) is called “Stars and Bars”. It was organized March 25, 1959 and was chartered on August 31, 1959. On local levels, memorial observances are held annually to remember not only the men who served in the War Between the States, but veterans of all wars. Meetings for the organization are held every 3rd Tuesday evening of each month at 6:30 p.m. in the home of a member. “Stars and Bars” motto is “A Quenchless Star, Forever Bright”.